The Denman ProEdge is the ideal tools for precise cutting. ProEdge's unique cutting ledge allows fast and accurate - scissor-over-comb cutting and clipper-over-comb cutting. Available in black or white. The Denman ProEdge is the ideal tools for precise cutting. ProEdge's unique cutting ledge allows fast and accurate - scissor-over-comb cutting and clipper-over-comb cutting. Helps improve posture and reduce fatigue. 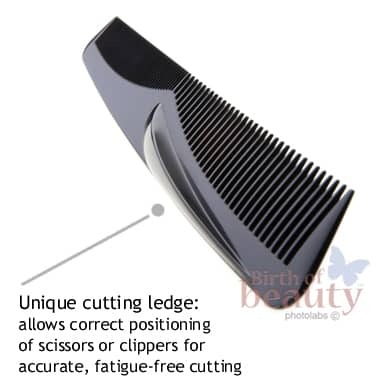 The comb features smooth rounded teeth which will not scratch the scalp or damage the cuticle. Available in black or white.